When Baysport got their hull form right they stayed with it, essentially scaling up and down for different length boats. Scaling rather than simply shortening or lengthening. Doing it this more expensive way has resulted in a range of boats with consistent, predictable behaviour. Unique is a risky word, but appropriate here I think, for the bottom shape Baysport created. The builder claims the hollowed lines of the keel section are responsible for a launch onto the plane that sees the hull lift bodily, without an interim lifting of the bow with its associated drag. Certainly, something made it happen to the Baysport 585 Offshore just as it did to previously reviewed Baysports 545 and 640. The 585 is rated for a maximum 150hp. The installed 115 Suzuki is a smallish percentage of that but performed well with three adults and two children on board, particularly considering the lumpy sea the day gave us. A sure sign of inadequate power is poor response to power trim, but the lightest of touches on the trim button set us up to take the sea from different directions. Baysport’s surface finish is up there with the best, but they hold the price down by restricting the number of moulded, gel coated surfaces they assemble. By some standards these are fairly stark boats, and the people who buy them could not care less. They are interested in boats that do the job. In current style the cuddy cabin takes up only a modest share of overall length, and does it by absorbing almost the whole of the foredeck into itself. And why not; foredecks on trailer boats have all the value of ash trays on motor bikes. This cuddy has bunk-settees just long enough for knees-bent sleeping, or more than half way comfortable with the infill in place. The infill covers the bay that would accept a chemical toilet – although a fabric bulkhead to replace the absent solid item would probably be insisted on as an accompaniment by at last half of the ownership marriage. As straight shelter the cuddy is thoroughly acceptable, with good sitting headroom and comfortable seat backs (side pockets behind them). Storage in cabins generally implies capacity for whatever is thrown in there, and there is room for lots of that. More tidily stowed stuff fits under the bunks, although the sharpness of the hull’s forepart limits the available volume. The cockpit is a roomy space with little to clutter it. An upholstered settee aft folds or is removable. Leave it at home and the room multiplies, leaving just the two first class seats at the dash. These are sliding jobs mounted on two-level cave lockers and provided with good foot rests. The navigator also gets a grab rail – the only one on board – and a personal side cave locker. The driving space is well protected by windscreen, raised sides and Bimini. No clears, but not a drop of spray made it over the windscreen despite the day’s conditions. The coamings are reassuringly high, and that at the transom is provided with padding courtesy of the absent settee’s backrest. There are few other specifically fishing items laid on, though a stable platform – which the 585 certainly provides – and elbow room are prime ingredients. Baysport laid on a drop-in bait board, snag-free stowaway quarter cleats and rod sockets. Long side pockets will also accept rods. 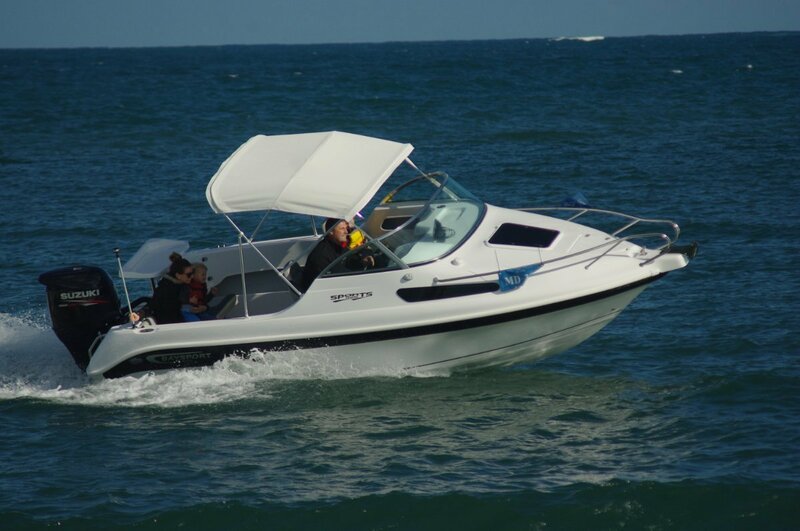 The market offers a much smaller choice of fibreglass trailer boats than in past years, but the design standards of those remaining are generally higher than ever. The Baysport 585 is a fine example.